If your knees are injured, you may find yourself giving up activities you love, like playing on the floor with your children. Climbing stairs or even standing up may have become an ordeal. The knee pain from a past injury, or the gradual wear and tear of arthritis can keep you on the sidelines and derail your active lifestyle. 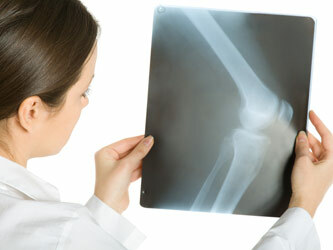 Orthopedic surgeons treat the knee more than any other joint. In fact, knees are among the most easily injured joints. As the largest joints in your body, they take a good deal of abuse. Walking, running, and bicycling can take a toll on your knees. Sports such as football, basketball, baseball and soccer can be particularly tough on knees as well. We at Premier Orthopedic Specialists Of Tulsa are dedicated to returning people with knee pain to their active lives. We work with you to restore your quality of life, managing medications and physical therapy, and offering the most advanced techniques in arthroplasty surgery. You may be treated non-surgically. However, if medications, changing your activity level, and using walking supports are no longer helpful, you may want to consider partial or total knee replacement surgery. By resurfacing your knee’s damaged and worn surfaces, total knee replacement surgery can relieve your pain, correct your leg deformity and help you resume your normal activities. You and your orthopedic surgeon would make a joint decision on whether a knee replacement would best fit your condition. Knee Arthroplasty is commonly performed to relieve pain and disability. It is recommended when the pain of osteoarthritis and cartilage damage becomes too debilitating. Knee Arthroplasty is major surgery. Prior to surgery, pre-operative tests are performed. A complete blood count, electrolytes, APTT and PT to measure blood clotting, chest X-rays, and ECG. Precise X-rays of the affected knee are needed to measure the size of components which will be required. Medications such as warfarin and aspirin will be stopped some days before surgery to reduce the amount of bleeding. Most patients are admitted on the day of surgery. Crutches or walkers are required until the quadriceps muscle has healed and recovered its strength. Continuous Passive Motion or CPM is commonly used. Post operative hospitalization averages one to three days. This depends on the health status of the patient, the amount of support available outside the hospital setting, and the patient’s reaction to the surgical procedure. The goal is to reach a functional range of motion over the first several weeks. At 6 weeks, most people have progressed to full weight bearing with a cane. Complete recovery from the operation, involving return to full normal function, may take three months or more and some patients notice a gradual improvement lasting up to a year or two after the surgery. As an alternative to total knee replacement surgery, Premier Orthopedic Specialists Of Tulsa offers partial knee resurfacing for a small group of patients who fit this specific criteria. The surgeon targets the diseased area of the knee without affecting the surrounding normal, healthy cartilage. Through a small incision of only 2-3 inches, the diseased part of the knee is removed and replaced with orthopedic implants. The knee is generally divided into three compartments including the medial (inside), lateral (outside), and patellofemoral (joint between kneecap and thighbone). Most patients with severe arthritis have significant wear in two or more compartments. For them, total knee replacement is often the best treatment. A small percentage of others have wear confined mostly to one compartment, especially the medial. These may be candidates for partial knee replacement.